Epithet originally applied to Catholic priests on account of their tonsure. Later the same epithet was extended to Greek Orthodox priests. 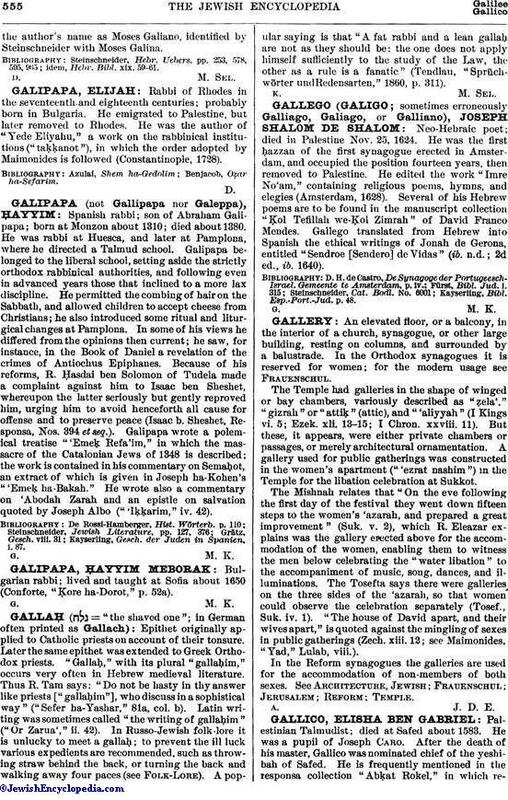 "'Gallaḥ," with its plural "gallaḥim," occurs very often in Hebrew medieval literature. Thus R. Tam says: "Do not be hasty in thy answer like priests ["gallaḥim"], who discuss in a sophistical way ("Sefer ha-Yashar," 81a, col. b). Latin writing was sometimes called "the writing of gallaḥim" ("Or Zarua'," ii. 42). In Russo-Jewish folk-lore it is unlucky to meet a gallaḥ; to prevent the ill luck various expedients are recommended, such as throwing straw behind the back, or turning the back and walking away four paces (see Folk-Lore). A popular saying is that "A fat rabbi and a lean gallaḥ are not as they should be: the one does not apply himself sufficiently to the study of the Law, the other as a rule is a fanatic" (Tendlau, "Sprüchwörter undRedensarten," 1860, p. 311).